He was more than just another pretty face. MISURATA, Libya - From Milan to Miami, from Moscow to Macao, Hermes scarves are flying at half mast in memory of trend-setting fashion icon Muammar el-Qaddafi. The beloved haute couture trailblazer was slain yesterday in his hometown of Surt. He was sixty-nine, but in his heart he was still the twenty-seven-year-old stud muffin who took over the reins of fashion in Libya in 1969. As the regenade designers who killed Colonel Qaddafi nearly came to blows over his Nokia cellphone-gun, his Swarovski-encrusted iPad2, his silk scarf, and one black Manolo Blahnik boot, true fashionistas around the world struggled to process the news of his death. BFF (Best Fashion Friend) North Korean dictator Kim Jong-il, issued the following statement. "That mutha-fucka was crazy. At the surprise sweet-sixteen party my loyal subjects gave me in 2006 to express their gratitude for my sixteen years as the ruler of North Korea, that crazy Quaddafi tried to drink all the Veuve Clicquot from the Wave machine. What a hoot." The Muammar el-Qaddafi memorial scarf from Hermes. Hotel, furniture, and clothes designer Todd Oldham expressed his awe at Colonel Qaddafi's ability to "wear anything and make it his; I mean literally make it his. Mo-Mo—we always called him Mo-Mo—was unique. You can't teach that sort of trademark indignation. It's got to come from within." Daddy Q, as Colonel Qaddafi liked to be called, was not one of those fey, winsome boy-men who flaunt their androgyny like a gaily colored Michael Kors cape. His was a man's man handsomeness, rugged and impenetrable, a face that looked as if it had been ridden hard and put away wet. It was also a face that was no stranger to a scalpel. In 1995 Brazilian cosmetic artist Dr. Liacyr Ribeiro was tasked with shaving years off Colonel Qaddafi's appearance by removing fat from his belly and injecting it into his face. The Libyan fashion leader also got hair plugs from a second physician at the same time. 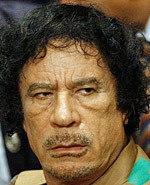 Dr. Ribeiro treated Colonel Qaddafi in his bunker, which "had two fully equipped and very modern operating rooms, a gym, and a swimming pool," said Dr. Ribeiro. "We're Sergeant Pepper's Lonely Hearts Club Band." True to Colonel Qaddafi's macho code, the procedures were done, at his insistence, with local anesthesia because he wanted to remain alert. Midway through he stopped to have a hamburger. "Colonel Qaddafi told me that he had been in power for twenty-five years at that time, and he did not want the young people of his nation to see him as an old man," said Dr. Ribeiro. "Mo-Mo wasn't about to let the chins fall where they may," laughed Gastronella Fellini-Rossi, long rumored to Colonel Qaddafi's favorite amuse bouche. "He was determined to rock that curly black mop until the end." Colonel Qaddafi's custom-made cellphone gun. The impact that Colonel Qaddafi had on fashionistas—not only in Libya but also around the world—would be impossible to overstate. Whatever his fashion mood—retro psychedelic, desert chic, military splendor, metrosexual cutting edge—it was copied from Khartoum to Kmart. The next time you see a proud man in desert regalia flowing down Main Street you can thank Colonel Muammar el-Qaddafi. The man they called Muammar, Moammar, or Mu'ammar, Qaddafi, Gaddafi, Gathafi, or Kadafi carried his country's fashion banner fearlessly for forty-two years. Through his many moods and mysteries, he never strayed from his core beliefs in flare and authenticity. 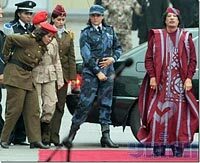 An avowed feminist, Colonel Qaddafi was one of the first dictators to employ an all-female bodyguard staff. In the end, however, he was struck down and his garments rent—the fashion world's greatest sign of disrespect—by wannabe trend setters who weren't fit to lick the hems of his garments. These brigands tried to rationalize their dreadful actions by accusing Colonel Qaddafi of holding the youth of his country down with his eternal boyishness and his constantly evolving sense of style. That, Dear Readers, is poppycock. Colonel Qaddafi had far more frenemies than true enemies. He gave and gave to his people—actually gave them the clothes off his back in the end—until he had nothing left to give. The Arab spring is in for a long, cold winter.